Hi Y’all! Can you believe we just entered New Year? Are you excited for 2019? Do you have any particular goals in mind? Well, I have been busy trying to plan my 2019, especially financially. I have already created my Budget Binder 2019 and my Weekly Monthly Planner for 2019. 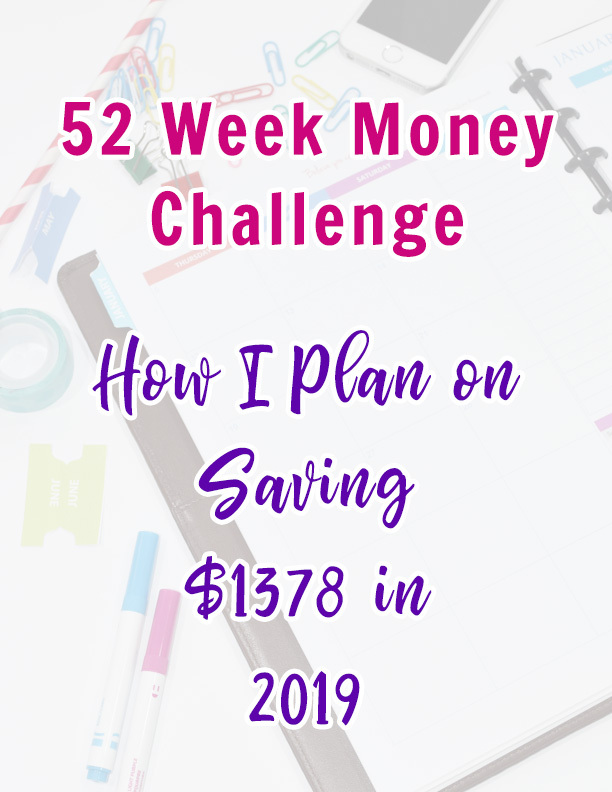 I am starting yet another planner, a 52 Week Money Savings Challenge, where I plan on saving certain amount of money each week. Set it aside, and increment the amount for next week as well. I came across 52 Week Money Challenge a lot this year, mostly on Pinterest. It seems to be very effective plan, so I decided to give this a try. My goal for each week is going to be an increment of $1, so by the end of 2019, I will be saving appr. $1378. Sounds reasonable enough, right? Here’s my document where I have written down the numbers with increments of $1 for each week. The printable for this incremental amount comes prefilled with the amount that needs to be saved. Amount you want to use for every week is totally up to you. You can start from $1 or even go up to $50. You should be fairly comfortable with the amount you want to use, because the way this system works is, you are going to have huge amount that needs to be saved towards the end of the year. That time also happens to be around December and Christmas. Time when most of us find ourselves on tight budget. So to make most of this system, if you want you can reverse the chart and start your year from the amount you are supposed to save at the end of the year. So, for instance, taking my spreadsheet above, you will be putting your first amount in your savings account is going to be $52, next week will be $51 and so on. You can also pick any amount from other weeks, save that much in your account and mark that week as done. Simple! Here’s another document that I created where you can fill the amount you are comfortable with. This printable comes with prefilled dates and that’s it. 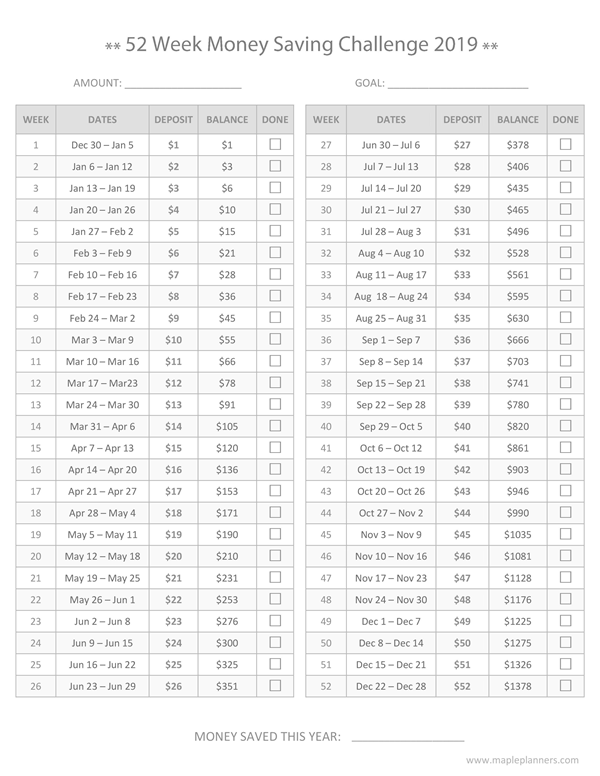 Just add up the amount you will be saving and fill the spreadsheet. I am going to try and write a series of posts where I will post the amount I saved for each week. 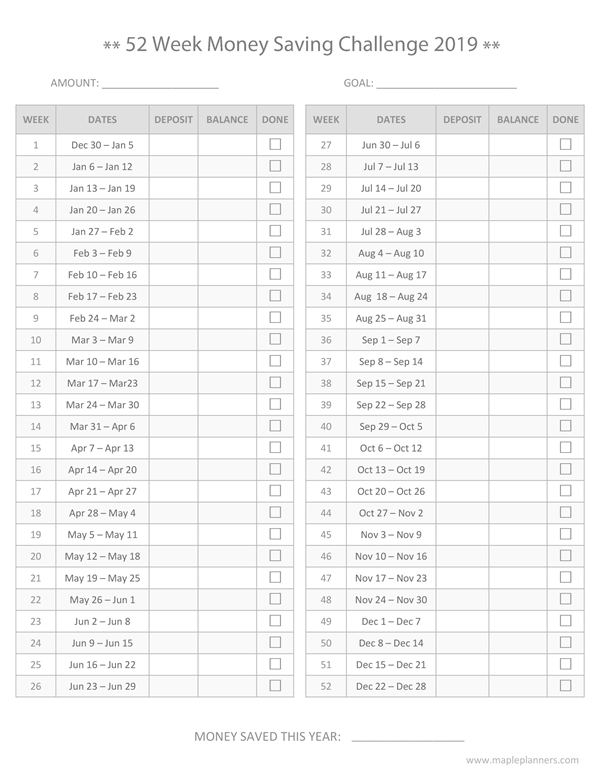 This way I will be able to track how I am doing with my savings goal for the year. So, are you ready to save money in 2019? Come, let’s see if we can reach our respective set goals in 2019. Please share how much you are planning to save in the coming weeks and months. Let’s say Goodbye to unwanted and unexpected expenses and say Hello to savings, and more savings!